HOT PINK style: Exclusive Invite for Hot Pink Style Readers!! Shopping, cocktails, beauty, and a giveaway... doesn't it sound like the PERFECT girls' day out? 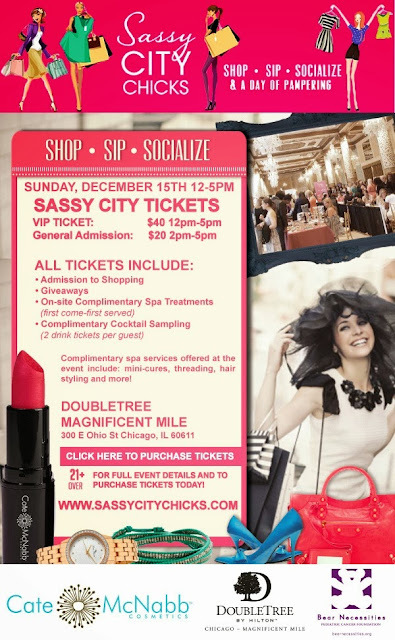 Sassy City Chicks is coming back to Chicago for their holiday show on December 15th from 12-5PM at the Double Tree Magnificent Mile! The event will be featuring top local designers and boutiques with INSANE discounts, so you can get that last-minute shopping in (and of course a little something for yourself). There will also be complimentary hair styling, threading, and more in their exclusive spa lounge. And they'll be giving away a Kate Spade leather bag at the event! You can learn more about the girls-only, 21+ event here. The best part? The first 30 Hot Pink Style readers to register will get FREE VIP TICKETS!!!! Use code HOTPINK at check out (bottom of the page above the "order now" button) and you're in! So gather up your girls and make make Sunday a Funday! Will do dear! Hope to see you again soon some time! Miss that pretty face! Sure. Do me a favor and email me your phone number so I can text you.